Every week Making A Mark gives an insanely talented artist some IADW brag-space. Today goes to Humberto Ramos, who is actually a pro - JLA: World Without Grown-Ups, Crimson, and currently Marvel's Spider-Man franchise - but this just has to be seen to be believed. 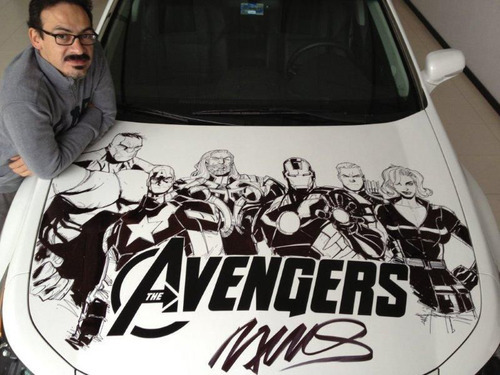 Humberto drawing The Avengers on an Acuna TL. The car from The Avengers movie now has The Avengers on it. Not just over the bonnet either, the superstar pensman etched out stunning images of Captain America, Loki, Thor and co. plus the obligatory Marvel and S.H.E.I.L.D. logos, the entire way around. Now before you get the idea to grab a few felt markers and scribble out Deathlok vs Wolverine all over your partner's pride and joy, you might want to take another few minutes to watch this video of the art/artist in progress. Ten-to-1 he's hidden Wasp in there somewhere. What do you think? Sound off below or click here for more great Making A Markists. To see more of Humberto's hot pencils, visit his website after the jump! I need to own that car. You do Random! I'm currently writing him a letter asking how much it will cost for him to draw Vision, Scarlet Witch, Wonder Man, Hank Pym and U.S. 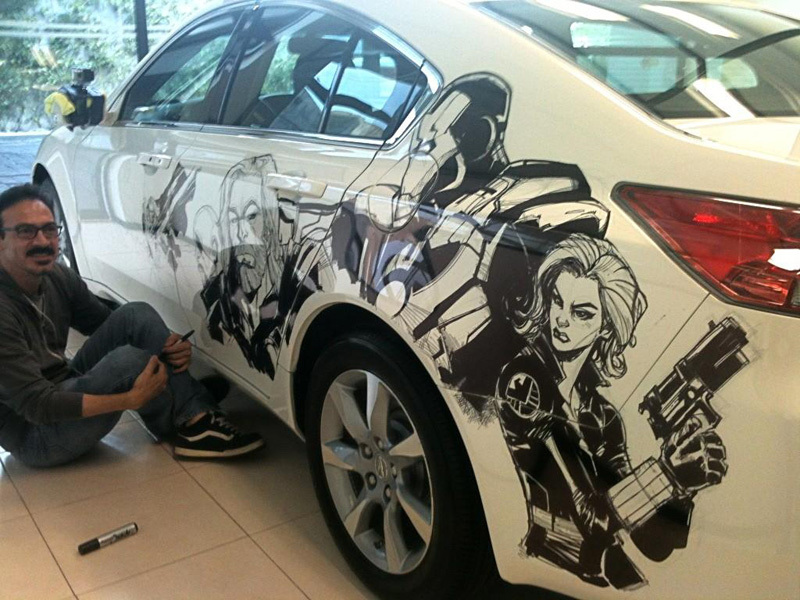 Agent on another car and we could drive around as Avengers East and West! I'm in on that! Avengers road trip! Oh, I want that car too! And I'm all for the road trip. Don't forget to envite me! We wouldn't dream of it Aliera. You can be in charge of the music playlist so start thinkin' of cool road songs! Music for an emotional spectrum, enought to humble the New Guardions. As long as we know what you meant, we're all good, Aliera. :) And even sometimes when we have no idea what each other is talking about, it's still fun. I say we put Dave in charge of refreshments. Okay, well, Dave says it'll be hard to do refreshments while he's video taping all of us for you tube. So I put Mr. Morbid on it. Lucky we'll have two cars then. Currently five plus drinks - thats a lot for one set of wheels!